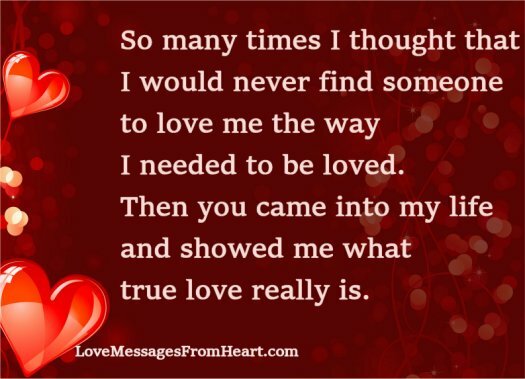 So many times I thought that I would never find someone to love me the way I needed to be loved. Then you came into my life and showed me what true love really is. I waited so long to find someone to love me, to truly love me. When you appeared seemingly out of nowhere, all my prayers were instantly answered. To have someone like you in my life, to me is the actual definition of happiness. There is nothing better in this life than to find someone to love and be loved in return. I consider myself the luckiest person on the planet to have found someone to love me like you do. I’m falling in love with these messages.